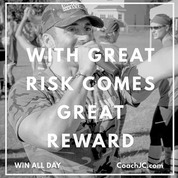 You must step out and take a risk to see a great reward. Significant wins along the way will be always be accompanied with struggles. Push forward so you can finish strong.